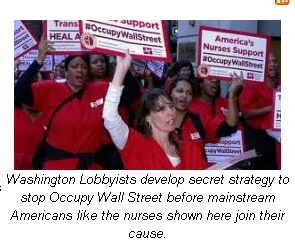 Wall Street Secret Plans to Destroy Middle Class and Occupy movement! It laid out a very specific plan to save Republican election candidates from losing this November because of their ties to big banks, as well as recapture the White House. How will they do it? By using a dirty tricks campaign to destroy the Occupy Wall Street movement within 60 days. Here’s how. With a client line-up like that, its’ no wonder Clark, Lytle, Geduldig & Cranford offered to single-handedly destroy the Occupy Wall Street movement. Their plan of action assured it could be at least partially complete within 60 days. Their price – $850,000. The above section explained in the firm’s own words why they want to destroy the Occupy Wall Street movement. Below, we quote excerpts from the CLGC firm’s memo detailing how they’re going to do it. The first step in their strategy is to survey the people whose opinions they’re going to try and sway – “women, seniors, suburban voters, GOP and Tea Party”. The surveys will include one large, national survey and eight local surveys in key swing states. Those targeted states are “Florida, Pennsylvania, Virginia, Wisconsin, Ohio, North Carolina, Nevada and New Mexico”. Once they have defined who ‘their people’ are, they will use the survey to find out their people’s greatest dislikes about the Occupy movement demonstrators. Once a rough character profile is created, the stated goal is to infiltrate the Occupy demonstrations and find the most offensive and embarrassing protesters to saturate the local media with. With many news outlets owned by some of CLGC’s very own clients and their corporate partners, enlisting the support of corporate media is a given. The key objectives of CLGC’s ‘opposition research’ tactic is to find out exactly who they’re up against. The memo echoes a widely circulating rumor that George Soros is funding the entire Occupy cause. Regardless, the banking and insurance PR firm suggests exposing whoever truly is funding the movement. Doing so, they suggest, will cancel out their grassroots beginning and “show they have the same cynical motivation as a political opponent”. The memo insists doing so, “will undermine their credibility in a profound way. A key strategic goal will ultimately be to show any evidence of fraud on the other side.” READ MORE HERE…..
Read the full CLGC memo from MSNBC here.